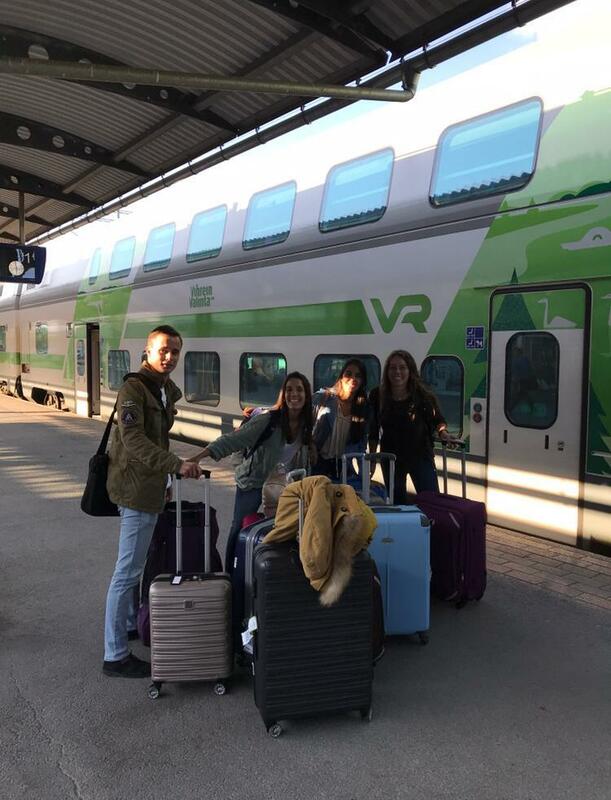 First minutes in Seinäjoki of the Erasmus students of the University of León during the Autumn semester of 2018 (from left to right: Rubén, Ana, María, and Marina). Today, I want to talk you about my first contact with Seinäjoki. On March- April 2018 I was noticed about the start date in SeAMK, which was 3rd September 2018, so I began looking for an air ticket. But before it, I needed to talk with the residence, to know when I could go into my room. They told me that I could enter on 1st September, but I thought that this time was going to be very precipitated to arrive, so finally, I bought my air ticket for 29th August, and during these days, until 1st September, I was going to be in an hotel in Seinäjoki. I bought this ticket before summer, and I thought that there was a lot of time until my travel, but finally it was not real, the time passed very fast, almost without realizing the summer. The days before my plane, I was very nervous, and I met with friends and family to say goodbye until Christmas. Then, 29th August, I travelled to Madrid with my grandfather, my boyfriend, and also my brother, and my sister in law. It was an amazing trip to Madrid, but then, there the time passed really fast (again), when suddenly I realized that I was in Helsinki, ordering my food. This moment was the most difficult for me, because although I travelled with some partners from my same Home University, just in this moment I felt that I was alone, without my family, but I realized that I was in Finland because it was my dream, and I would enjoy each moment in this new country for me. Then, we travelled to Seinäjoki in a nice train, where I began feeling the differences with respect to Spain, like for example: In Finland the people in the train were in silence, and also, there was a booth to talk on the phone. After two hours, we arrived to Seinäjoki, where there were two Student Tutors, who helped us a lot, and also they accompanied us to the hotel. There, we took a shower, and after that, we went to see the city, but there was late, so we only saw the University building, and then we went to have dinner, but suddenly something strange happened: Our tutor phoned us to notice that our hotel was on fire, but we thought it was a joke, although quickly we realized that here the people don´t play with this important things, and we saw our hotel on fire. This moment was terrible because this was our first our here, but we trust that everything would improve. After the scare, we took our luggage, and we were replaced to other hotel where we had really good days. Next morning we went to see the University, the residence, and the city centre which were very nice, and also different for us, but I will talk you about it in more detail very soon. I am very happy to writing you, because I want to tell you a lot of things about my life here, but very soon you will see a new post talking about day to day in the University, so I am looking forward to writing it. I hope all of you have enjoyed this post, as much as I have enjoyed writing it. Meet us on our blogsite soon!